If there's any part of my body that's most abused... that would be my hair, unfortunately. Whenever I'm busy, I'll just put them up in a bun. If I'm on my Pilates / Yoga class, I'll put on a headband and push them away from my face. If it's winter time, I'll carelessly swoosh a blower to my tresses and I'm set. Add to the fact that I frequently have them treated :( Digiperming, colouring and all that jazz. Typing this make me want to say sorry to my hair! 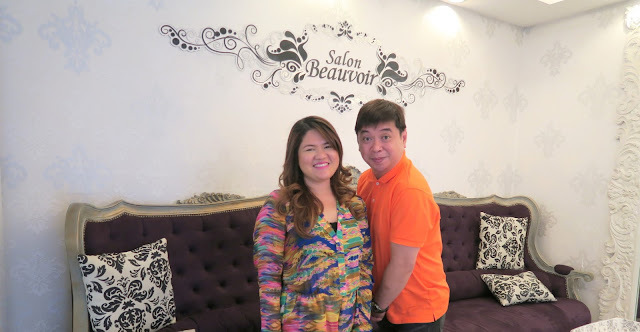 I mentioned that I've tried some hot oil treatment from Tony & Jackey (full post HERE). Honestly, it didn't resolve much of my dilemma. Then I spotted this specific treatment from Deal Grocer! Okay - let's fast forward a bit. The right picture below is the finished product! I'm giggly when I saw this because it feels that my hair went back to life! Not entirely, but getting there. The place is very Parisian! It screams French all over. From their mirrors to the signs, you'll love it here. I like that there's not much people even if it's a Saturday! (get this: even on weekends). That's not to say they have no main cult following but I guess since the price points are steep, that goes to show that their customer base has some moolah to burn! Seriously, they thought of everything. See that black bean bag below? That's your foot rest. Amazing, isn't it? And you can choose among red iced tea, hot tea or coffee. Wifi is also available. How comfy can you get? Let's tackle the basics first. The treatment costs Php 7,500 (about £110) but I got it at ~50% off. 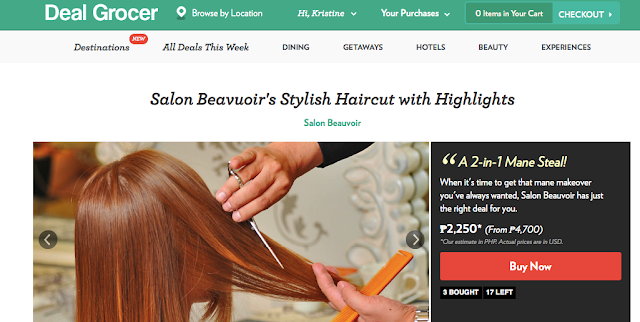 I paid approximately Php 3,400 to Deal Grocer (via Paypal). And then the magic question: Did it work? Yes it did! I got so many compliments on how my hair looks so healthy. You've got to understand that I rarely get hair praises because my hair is always dehydrated :P So this made me happy! Thanks to Chill (below) and Ate for doing their magic! The only downside is that I am missing my curls! :( The treatment stripped off my remaining digipermed locks and I was aware of that even before availing this. 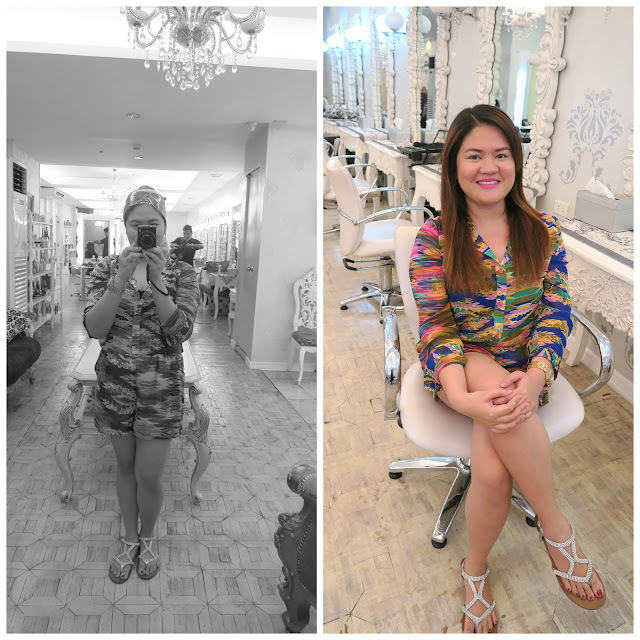 I vowed not to undergo a perm this year as part of my hair detox. However, I cannot skip my hair colour. Me having a half and half hair is just plain awkward. Below is the range of products that they use / sell. I am not a fan of impulsive buying so I decided not to make additional hair purchases that day. Another thing is they instructed me to wash my hair on Monday (I got the treatment on Saturday). However, on Sunday I was having an itchy scalp plus I'm a bit paranoid that the chemicals are creeping through my brains (yaz, I'm weirdo like that) - so I gave in. Took a bath that Sunday night!